Royal Air Force Harrier II from the RAF Strike Attack Operational Evaluation Unit. No other jet fighter quite captures the imagination in the same way as the Harrier. To witness it in action for the first time is an experience few can easily come to terms with. A fighter flying at 500 knots and very low is fairly commonplace; but when that same aircraft suddenly decelerates to a standstill and starts flying backwards, hovering like a helicopter before landing vertically on a tiny patch of ground, it takes on a different perspective. Only the Harrier can do this, and in its updated redesigned form, it is continuing to prove its worth as the world's finest V/STOL close air support fighter. Although capable of VTOL (Vertical Take Off and Landing) performance, the Harrier usually operates in the STOVL mode (Short Take Off and Vertical Landing), allowing it to haul a hefty warload from confined spaces without the need for conventional hard runways. The Harrier is a proven combat aircraft with distinguished service in the Falklands Campaign and the Gulf War. Harrier IIs from the United States Marine Corps flew hundreds of close air support and interdiction missions during Operation Desert Storm from forward airstrips close to the Saudi/Kuwait border which could not be used by other, conventional attack aircraft. 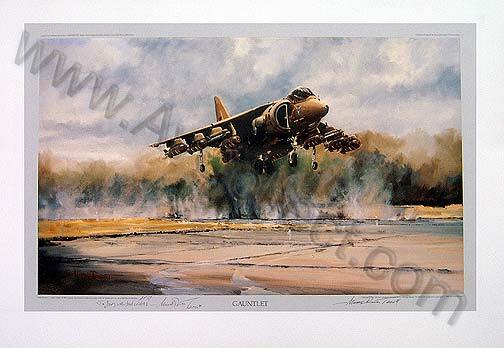 'GAUNTLET' portrays a bomb-laden Harrier from the RAF Strike Attack Operational Evaluation Unit in STO-motion, transitioning to forward flight from a short take off run at about 100 knots as the aircraft rapidly accelerates to cruising speed. It is carrying two AIM 9L Sidewinder missiles, ADEN 25mm cannon pods and seven Hunting BL755 cluster bombs - double the warload of the earlier Harrier variants. The intense action and powerful pace of the scene are combined with the authority and technical accuracy of a pilot's eye for detail, - the distinguishing feature of Michael Rondot's combat aircraft paintings. Each print in the Single Limited Edition is signed, dated and numbered, stamped with the Collectair seal and issued with a numbered and signed Certificate of Authentication to guarantee the edition size. Taken from a single limited edition of 500, numbered and stamped with the Collectair seal and individually signed by Michael Rondot. A numbered and signed certificate is issued with every print to guarantee the total edition size and authenticity.